1993-10-01. New. Ships with Tracking Number! INTERNATIONAL WORLDWIDE Shipping available. Buy with confidence, excellent customer service! 1977-06-01. New. Ships with Tracking Number! INTERNATIONAL WORLDWIDE Shipping available. Buy with confidence, excellent customer service! 2009-09-09. Good. Ships with Tracking Number! INTERNATIONAL WORLDWIDE Shipping available. May not contain Access Codes or Supplements. May be ex-library. Shipping & Handling by region. Buy with confidence, excellent customer service! 2015-07-08. Good. Ships with Tracking Number! INTERNATIONAL WORLDWIDE Shipping available. May not contain Access Codes or Supplements. May be ex-library. Shipping & Handling by region. Buy with confidence, excellent customer service! 1988-05-27. Good. Ships with Tracking Number! INTERNATIONAL WORLDWIDE Shipping available. May not contain Access Codes or Supplements. May be ex-library. Shipping & Handling by region. Buy with confidence, excellent customer service! Samuel French Ltd. PAPERBACK. 0573110735 New Condition. . New. Methuen Drama. PAPERBACK. 0713685514 New Condition. . New. Methuen Drama, 1983-10-13. Paperback. Used:Good. 1977-06-01. Good. Ships with Tracking Number! INTERNATIONAL WORLDWIDE Shipping available. May not contain Access Codes or Supplements. May be ex-library. Shipping & Handling by region. Buy with confidence, excellent customer service! Methuen Drama, 2007-04-11. Paperback. Used:Good. Methuen Drama. PAPERBACK. 0713685514 Like New Condition. . Fine. Samuel French Ltd. PAPERBACK. 0573110735 Like New Condition. . Fine. Samuel French, 1977-12-31. First. Paperback. Used:Good. Samuel French Ltd. PAPERBACK. 0573110735 Special order direct from the distributor . New. Bloomsbury Methuen Drama, 2015 Book. New. Paperback. New and in stock. Heinemann Educational Books Ltd. Hardcover. 0435233009 Brand New ,Original Book , Direct from Source , Express 5-8 Business days worldwide Delivery. . New. Samuel French Ltd. PAPERBACK. 0573110735 Brand New ,Original Book , Direct from Source , Express 5-8 Business days worldwide Delivery. . New. Hardback. New. The Heinemann Plays series offers contemporary drama and classic plays in durable classroom editions. Many have large casts and an equal mix of boy and girl parts. Confusions is a collection of five interlinked but self-contained plays dealing with human loneliness and hypocrisy. Hardback. New. The &quot;Heinemann Plays&quot; series offers contemporary drama and classic plays in durable classroom editions. Many have large casts and an equal mix of boy and girl parts. &quot;Confusions&quot; is a collection of five interlinked but self-contained plays dealing with human loneliness and hypocrisy. Samuel French Ltd, 1977-06-01. First Edition. Softcover. Near Fine. Both the perimeters of the covers and the text block have light toning. There is a red sticker on the cast page (2nd leaf) stating: "The publication of this play in French's Acting Edition must not be taken to imply that it is available for performance." Assumed first printing with no subsequent listings or corrections on the cppyright page. London: Samuel French, 1977. 6/28/2011. Fine. First edition. Fine in wrappers. Paperback. New. 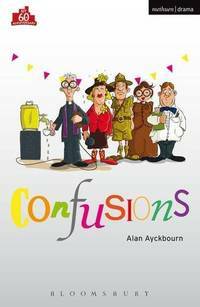 Five one-act plays from 1976 by Britain's most popular playwright, Ayckbourn's classic series of plays are presented in a Student Edition with a full introduction, commmentary and questions for study. Methuen Drama, 2007-04-11. Paperback. Good. Samuel French Ltd Book. Used - Acceptable. Paperback. Ex-library with the usual stamps and labels. Text body is clean, and free from previous owner annotation, underlining and highlighting. Binding is tight, covers and spine fully intact. Cover shows surface and edge wear..
Samuel French Ltd, 1977. Soft cover. Very Good. Copyright page gives 1977 as the date but this is a presumed later reprint. Paperback in Very Good condition. Light edge wear, a little creasing to lower rear corner, surfaces slightly sunned but clean, 68 pages, a little light creasing in places but clean, no inscriptions, binding tight. Price includes standard postage worldwide. Samuel French, 2006-07-01. Paperback. Good. Methuen Drama, 1983-10-13. Paperback. Good. Methuen Drama. Used - Very Good. Ships from the UK. Great condition for a used book! Minimal wear. 100% Money Back Guarantee. Your purchase also supports literacy charities. Methuen Drama. Used - Good. Ships from the UK. Former Library book. Shows some signs of wear, and may have some markings on the inside. 100% Money Back Guarantee. Your purchase also supports literacy charities. Heinemann. Hardcover. 0435233009 PREVIOUS OWNERS NAME ON FIRST ENTRY PAGE . Good. Samuel French. Used - Good. Former Library book. Shows some signs of wear, and may have some markings on the inside. Heinemann. Used - Good. Good condition. Writing inside. Heinemann. Used - Very Good. Very Good condition. Methuen Student edition. Methuen Drama, 10/13/1983. Paperback. Used; Good. **WE SHIP WITHIN 24 HRS FROM LONDON, UK, 98% OF OUR ORDERS ARE RECEIVED WITHIN 7-10 DAYS. We believe you will be completely satisfied with our quick and reliable service. All orders are dispatched as swiftly as possible! Buy with confidence!